At least 12 tons of concrete collapsed onto a car in a Big Dig tunnel, fatally crushing a passenger and prompting renewed scrutiny Tuesday of a troubled highway project that is already the costliest in U.S. history. The state attorney general said he plans to treat the site as a crime scene that could lead to negligent homicide charges. The attorney general's office already has begun issuing subpoenas to those involved in the design, manufacturing, testing, construction and oversight of the panels and tunnel. Yeah. Good luck with that. The firm responsible for 'the design, manufacturing, testing, construction and oversight of the panels and tunnel' is one of the best connected companies in the nation - Bechtel. 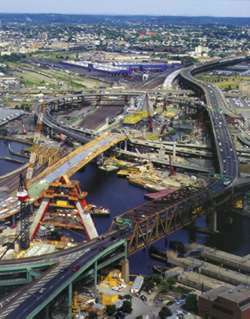 The 'Big Dig' was a major renovation of the highway system in the Boston area. By building tunnels, rather than putting the highways above ground, Massachusetts was able to use a lot more space than they would've otherwise. It was expensive and Bechtel only made it more expensive. Bechtel managed the project, which was corrupt from the gitgo. According to a May 6 AP story, "Six men who worked for the Big Dig's largest concrete supplier were arrested Thursday on federal charges they falsified records to hide the poor quality of concrete delivered to the massive highway project." They were employees of Aggregate Industries, a subcontractor. They defrauded the project by selling concrete that was too old and, in some cases, had double-billed loads. "The company was paid $105 million for 135,000 truckloads of concrete," AP reported, "And at least 5,000 of those truckloads did not meet specifications, according to the indictment." "According to the indictment," AP tells us, "The faulty concrete was poured into walls and roof slabs in the Interstate 93 tunnel, parts of the Interstate 90 tunnel and the sea walls of the Fort Point Channel, among other places." The ceiling slabs collapsed in the I-90 tunnel. Throughout the project, the Big Dig has been hobbled by fraud, corruption, waste, and shoddy construction. The Boston Globe reported in February of 2003 that planning and construction errors alone had cost more than $1 billion - billion with a 'B' - in overruns. One example was leaving the FleetCenter out of the blueprints. • During the 17 years it has managed the Big Dig, Bechtel has neglected to perform basic work called for in its contracts, such as conducting crucial field surveys of the elevated Artery, and verifying the locations of utility lines and buildings such as the FleetCenter. The failures contributed to more than $350 million in construction overruns, project records show. • Construction on virtually all of the Big Dig's major contracts began with incomplete and error-filled designs, which led to nearly $750 million in other construction cost overruns, records reveal. Bechtel created the basic design for the entire Big Dig, set the design schedule, and signed off on all the final design drawings. • Bechtel failed to heed warnings of problems in the design drawings, even from its own engineers, records and interviews reveal. Those deficiencies were usually fixed only after contractors discovered them, when it was far more expensive to make changes. In almost all cases, Bechtel solved the design problems by recommending that the state approve hundreds of millions of dollars in payments to contractors for additional work. • Bechtel failed to detect or call attention to serious flaws in construction work, leading to tens of millions of dollars in repair and delay costs. It goes on and on. According to CorpWatch, "Bechtel fails to explain how the original price tag of $2.5 billion spiraled upwards every, until in 2003 it had hit a whopping $14.6 billion or $1.8 billion a mile, making it the world's most expensive highway." Bechtel was also a company given one of those notorious 'no-bid' contracts to rebuild Iraq. The reason is clear; the Independent reported in April of 2003, "Bechtel has made $1.3m in political donations over the past four years, 60 per cent of it to Republicans, according to the Center for Responsive Politics, a Washington campaign watchdog. Its board of directors includes George Shultz, who was secretary of state during the Reagan administration. Its chairman and chief executive, Riley Bechtel, was recently appointed to George Bush's export council." SourceWatch tells us that as of February 2006, "San Francisco-based Bechtel has been given tens of millions to repair Iraq's schools. Yet many haven't been touched, and several schools that Bechtel claims to have repaired are in shambles. One 'repaired' school was overflowing with unflushed sewage; a teacher at the school also reported that 'the American contractors took away our Japanese fans and replaced them with Syrian fans that don't work' - billing the U.S. government for the work." Back to the Big Dig, Massachusetts Attorney General Tom Reilly said of the I-90 ceiling collapse, "What we are looking at is anyone who had anything to do with what happened last night. No one is going to be spared." Given the amount of corruption, fraud, and negligence involved, Massachusetts would have to build a new prison to house all of those responsible. But that's only if justice is served. Otherwise, Bechtel will pay a fine or settle a suit for billions - and still walk away with billions more. And these guys are 'rebuilding' Iraq. UPDATE (7/12/06) -- From CNN: BOSTON, Massachusetts (AP) -- The head of the agency overseeing Boston's Big Dig highway project ordered a review of the entire highway system Wednesday after investigators looking into the fatal collapse of concrete ceiling slabs found 60 more questionable areas inside the same tunnel.